Jakarta, UIN News Online â€“ A number of High School students, on Friday, (5/5) are came to visit UIN Jakartaâ€™s booth at Jakarta Islamic Center (JIC). They seemed so eager to ask questions and asking for information regarding UIN Jakarta. 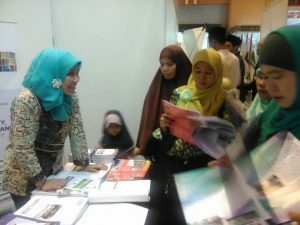 For the first time, JIC held a three day educational exhibition, Friday-Sunday (May 5-7), at Jakarta Islamic Center Convention Hall, Koja, North Jakarta. The event which inaugurated by the Deputy Governor of Jakarta Djarot Saiful Hidayat is participated by 15 islamic higher education institution, including UIN Jakarta. UIN Jakarta booth since the opening of exhibition is always crowded by visitors. Most of them are students from high school / vocational school orÂ madrasah aliyah, which deliberately invited by the committee. The students were not only asking about new college admission but also campus location and public transportation route. Knowing that they did come from several regions and have never seen UIN Jakarta before. â€œI just know UIN Jakarta Campus from the alumnus that study there. But I donâ€™t know the exact location yet,â€ said one of the visitors to UIN News Online. Another visitor, Ana, said to have agreed to enroll themselves to study at UIN Jakarta. Her reasons are, besides UIN Jakarta has the study program to her interest, the commuting distances also a major consideration. â€œBut itâ€™s not possible to commute daily. I need to rent a place,â€ said Ana who hopes this year she can be accepted at UIN Jakarta.